Last fall, just after David Damron turned The Minimalist Path blog over to its new owner, Rick was kind enough to publish a guest post from me, the first in an unsuccessful series of posts aimed at finding the site some new writers. A malfunctioning popup caused the site’s DISQUS comment system to have some problems and very few comments got through. Today, I’m giving that ill-fated post a new airing, it’s first appearance on So Much More Life. I’ve realized something important in the year or so that I’ve been reading so-called minimalist blogs: I’m one of you. For a long time, I hesitated to call myself a minimalist. I’ve always been interested in simplicity — even when I wasn’t living a simple life. And I’ve always been interested in frugality — even when I was eating out almost every night. 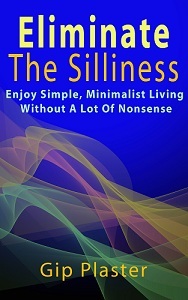 When I first started learning about voluntary simplicity and frugal living, no one called it minimalism. Some minimalists I’ve seen on the Internet lead lives very different from mine. They’re 20-something men running along island beaches in white t-shirts, khaki shorts and “barefoot” shoes toward extended stay hotel rooms containing only a small backpack, two other white t-shirts and a pair of black shorts — for variety. They don’t own cars, and they access the Internet from cafes more idyllic than any that I’ve ever found. I’m 30-something and live in a house on an acre of land somewhere in rural Texas, thirty miles from the city I call home and a dozen miles from anything resembling a town. My car is indispensable because of the distance to civilization and because my back and knees have been opposed to running since I was 16. I work from home on a desktop computer and rarely take my netbook for any exercise at all. Like you, I’m on a journey, though, even if my journey isn’t exactly like yours. And the path is wide. There’s plenty of room for all of us. Here are four big steps I’ve taken on the minimalist path. Do they match yours? I launched my blog, So Much More Life, in late 2009 to help me put together the disjointed to pieces of my life. I was a former freelance journalist who had accidentally taken a seven-year detour into the world of online bookselling. Before I launched So Much More Life, the pieces of my life were working okay, but there was no real flow. I used the early days of my blog to organize my thoughts and projects — mostly for my own benefit. Now, there’s a creative energy that passes from one project to another because my life is starting to move forward in one big stream rather than in ponds and canals. For me, the second step along the path was decluttering. Clutter is a frustrating distraction because it makes life seem out of control. Since I don’t live out of a suitcase and have lived in the same place for nine years, I’ve accumulated a lot of stuff. Most of it seemed more like it belonged at a Goodwill thrift store, so that’s where I took it. I’m removing more items from my home every chance I get, and I’m feeling better about it every day. I added weekly Decluttering and Simplifying 2010 updates to my blog to keep me on track and accountable. It worked and is still working. For me, leaving silly systems behind is the easiest part of following the minimalist path. I pay an electric bill, telephone bills and for trash service, but otherwise, I try to remove myself from as many corporate and political systems as possible. I’m apolitical anyway, but leaving systems means eliminating cable television, magazine subscriptions and even season tickets to focus your life on fewer, simpler, higher-quality experiences. As I’m coming to the end of my 52 weeks of decluttering updates on my blog, I’m realizing that I haven’t accomplished everything I’d hoped. There are still a few more weeks, but for me, simplifying and decluttering is a continuous process that I hope will continue throughout my life. As a minimalist, however, my life is about much more than integrating my projects, decluttering my home and eliminating other people’s silliness. I’ve made a lifelong commitment to living a meaningful life. I may have fewer things around than some other people, but because I’m not distracted by uselessness, my life will always be filled with experiences beyond many people’s imagination. Backpacks and khaki shorts are nice, I suppose, but they’re not the only way. What’s really hard to believe is that I think the original appearance of this on TMP might’ve been the first post of yours I ever read. I think your blog is definitely taking a better direction since the end of the decluttering updates. If this is the first post of mine you read, Robert, then this post made more of an impact than I imagined. Thanks for being an important supporter of my blogging work. And I like the direction of my blog in recent weeks, too. I think I’m on the right track. nice post. i wrote a similar one a few weeks back as well basically questioning whether or not i was a minimalist and i like the way you describe it as a “wide road.” so very true. i don’t think there can be one definition of the minimalist and as long as we understand the concepts and keep working towards that lifestyle, we can indeed still be minimalists in the truest sense of the word. marianney recently posted so you want a life of freedom eh the secret to life! Welcome to the So Much More Life conversation, Marianne. I’m glad you’ve joined us on this lane of the very wide road. That’s a good blog name, actually… The Very Wide Road. Congrats on the de-cluttering and simplification of your life and blog. I have learned much in my years and experienced enough to know that simplified life is the ultimate happiness. If you get yourself around people that like to gab about so-and-so and make irrational decisions, if clutters up your way of thinking and can also be contagious. Run away!! But, in turn, is the same way for your business and/or blog. Keep it simple and light, don’t overwrite one’s posts! Thanks for commenting, Jasmine. I hope you become a regular part of the conversation here. There are lots of simply amazing people who stop by. Please can someone think of the best term/description for aspiring and actual minimalists that are in their 30’s, need (not want) a car and don’t wear khaki’s????????????????????????????? I just had to hop in on this one as we talk alot around our place about how we don’t feel like we fit the bill of stark, sterile minimalists, and yet we live simply, and have radically simplified so we could move overseas. We love color as well as simply furnished spaces with clean lines. We have started calling it modest minimalism. Modest as in right sized, not over the top or extreme, just enough. We have no desire to go furniture shopping and replace all the stuff we got rid of, we have been getting healthier so our wardrobe is shrinking in more than one way and will need to be judiciously replaced, not with khakis 🙂 We own a paid for older vehicle that runs like a dream and gets great gas mileage, as we live on an island we’d spend the whole day walking to a store or hitch hiking, so that is practical for us, if we lived in a smaller village where more was in walking distance, we’d be up for a car free life. At any rate whether you want to call it sustainable minimalism or modest minimalism, realistic minimalism or suburban simplicity define minimalism or simpler living as you see it, where you are comfortable, stretch yourself occasionally and then if something was too extreme back off of it until you find your “right sized” life. No matter what, hope its a fun one! Jo, I’ve never found any overt Christian connection to “voluntary simplicity”. They might be a subset of the group, but I’m not aware of them defining it. As for the term….I’d just call you a “minimalist”. Even Everett admits that he drives cars occasionally – he just rents them when he does. And we won’t get started about the jet-setting around the country to meet up with other minimalists to talk about how authentically minimal they all really are. Maybe a better term for people in our boat is “realistic minimalist”…..? Realistic minimalist sounds like a great term, as does sustainable minimalism. The kind of minimalism some bloggers promote doesn’t work in all situations and can’t be sustained over the long term if you have a family, a day job or any voluntarily commitments of any kind. I think I may have owned some khakis — which I suspect I pronounce differently than Jo — but I don’t have any now. How do you pronounce it? – intrigued…. Man oh man you have me cracking up about the jet-setting to meet other minimalists! ROFLMAO (and I don’t care how uncool it looks, either). I like the idea of combining your blogs. They would go together nicely. I’m surprised that people are enjoying seeing this post (or seeing it again). I guess I need to re-read it. It must be better than I thought! I love your focus on experiences for a more fulfilling life. I read an article on NPR recently about a study that showed that money spent on experiences gives more happiness than money spent on having things. I think that’s true, Maria. I certainly have more fond memories of experiences than things. I can’t think of any item that gives me joy, but a good concert always does. I used to enjoy plays, but I’ve found I’ve outgrown them in favor of live music.